The Perm-36 Memorial Center of the History of Political Repression was recently shut down, and it remains unclear whether this was because of a recent ideological tendency to rehabilitate the Stalin era or just a cost-cutting initiative. Until recently the city of Perm, 800 miles east of Moscow, had frequently been labeled one of Russia’s most progressive, following an explosion in museums and cultural centers in the last few years. Yet this renaissance appears to have entered a decline as the regional government has withdrawn funding for various initaitives, and the latest victim is Russia’s only preserved Stalin-era labor camp, the Memorial Center of the History of Political Repression Perm-36, which was closed in April. 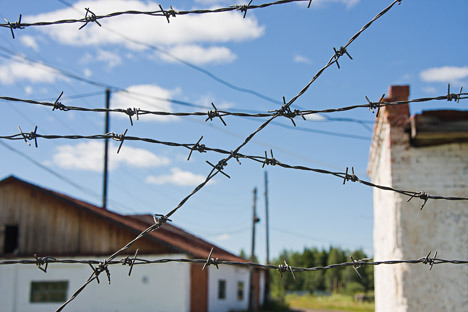 The museum encompasses the huge territory of a former colony in the Perm Territory, where from 1946 onward those convicted of “dangerous state crimes” served out their sentences. According to the famous human rights defender Sergei Kovalyov, who was imprisoned in this camp, the authorities began sending so-called “political” prisoners – nationalists from the Baltic republics and Ukraine, along with Moscow dissidents – here in the early 1970s. The Perm-36 museum, which was founded in 1994 by the private Russian human rights organization Memorial, was unlike most others, as Commissioner for Human Rights in the Perm Territory Tatyana Margolin explained to RIR. “This was an example of the successful cooperation of the administration and social organizations. The state owns the former colony’s infrastructure but non-governmental organizations own the ‘filling’, i.e. the exhibitions, archives, and various excursions and scientific and educational programs,” said Margolin. The museum acquired fame throughout Russia with its annual festival Pilorama (‘Sawmill’), which attracted leading musicians, artists, actors, and human rights workers. This was all possible while the power in the Perm Territory was in the hands of Oleg Chirkunov, a man who earned a reputation as a patron of the arts and as a person with progressive views. Under Chirkunov many festivals were established and funds were generously provided for art projects. The famed gallerist and cultural representative Marat Gelman opened the PERMM Museum of Modern Art with the support of the governor, and the famous theatrical producer Eduard Boyakov opened the politically topical Scena-Molot (‘Stage-Hammer’) theater. However, after Chirkunov was replaced by new governor Viktor Basargin in 2012, cultural and educational projects began to be curtailed, and the Pilorama human rights festival had its funding completely cut off, after which it ceased to exist. Now it is the museum's turn. This year, the former leadership of the museum, Viktor Shmirov and Tatyana Kursina, were fired. The replacement for the position of director was an official from the Perm Ministry of Culture, Natalya Semakova, who had had no prior relationship to the museum. In July, after a series of unsuccessful attempts to restore the status quo, the non-governmental organization Perm-36 officially announced its termination of cooperation with the museum. It is currently preparing to collect all of its property - literally all of the museum’s collections. It is unclear what will be displayed in their place at the museum, though in any case it is closed for now. Meanwhile, the regional administration is reassuring the public that the work of the museum will continue. Sergei Malenko, the Director of the Department of Civil and Special Programs in the Administration of the Governor of the Perm Territory, announced at a press conference on the situation that the museum will not veer from its current course. "Exhibitions about the history of the Gulag in the Soviet Union and the history of the Gulag in the Perm Territory will be set up," said Malenko, adding that the museum would feature a large-scale exhibition of the history of political repression during the Soviet period, with a special section dedicated to the Romanov dynasty, as well as the creation of “a large scientific library which promises to be the largest in Russia.” Malenko said that the possibility of including the site in the UNESCO World Heritage Site list is also being considered. However, Arseny Roginsky, the Chairman of the Board of the international society Memorial and one of the museum’s founders, did not hide his dissatisfaction with the situation: "The Administration of the Perm Territory accuses our non-commercial organization of pestering them for money. It's all nonsense... It's just that the state has decided to take control over public organizations, especially in such a sensitive area as the history of the country," he told RIR. The human rights defender joked bitterly that now the museum's chief consultant will appoint former guards and will talk about how bravely the security forces guarded the prisoners. The emotion of the former guards found support in the ambiguous social movement The Essence of Time, led by theater director and TV presenter Sergei Kurginyan. The group publically accused the museum of pro-American politics and the distortion of history, again, referring to the testimony of the former employees of the colony. But the issue does not solely concern Perm and its museum. Public opinion about the Stalinist repressions has radically changed since the perestroika era. The staff at the Laboratory for Media Studies at the Higher School of Economics, who interviewed villagers in Tatarstan this May, confirmed this: Many of them speak warmly of the period of Stalin's rule. While recognizing that mass repressions certainly took place, they are confident nonetheless that the "strong arm" of the authorities guarantees order in the country. Furthermore, the issue of restoring Stalin's name to cities, streets and squares, and even of erecting monuments to him comes up periodically, not to mention the massive sales of calendars with Stalin on them and other souvenirs related to the dictator. This trend, which is taking on a mass character, appears to be opposed by few. Among such opponents is the society Memorial, which has been researching the history of political repression in the USSR for many years and holds competitions for high school students in historical research. In Moscow, meanwhile, visitors can explore the Museum of the History of the Gulag. While it may be small, what is important is the fact that both adults and children go through its exhibition and on walking tours of the locations of the Great Terror. And recently a group of enthusiasts headed by the opposition activist Sergei Parkhomenko has launched a new initiative titled ‘The Last Address’, which plans to put up memorial signs on the houses of those who were illegally repressed.